The Owls were on top of the conference last year, but this time around, things have changed. They’ve started the season 1-11 and are eliminated from the postseason. Kelsey Zenuk charges toward the goal last week at team practice at Geasey Field. The freshman midfielder is having a solid rookie campaign for the Owls, netting seven goals and eight points in 12 games of action (Nic Lukehart/TTN). Sometimes, struggles can define seasons. And when it takes 11 tries to win one game, that definition is secure. 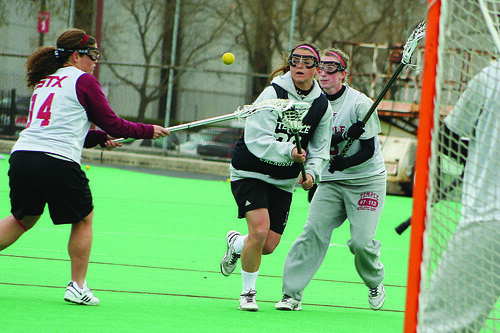 The lacrosse team picked up a win last Sunday, its first since the 2008 Atlantic Ten Conference Championship. The Owls were led by three goals from freshman midfielder Kelsey Zenuk, who is one of nine rookies contributing this season. The win gave the Cherry and White hope to finish with a .500 record in the conference and with it, a shot at postseason play. However, a disappointing 16-4 loss Saturday at Massachusetts sent Rosen and her squad crashing to reality. The Owls are now surely out of the running for a spot in the A-10 Tournament and a chance to defend their title. The loss against UMass was the team’s worst of the season. It also clinched the worst season in Temple history since the number of games played increased to more than 10 in 1979. Should the Owls win their final three games, their record would still be the worst since the 5-8 record from the 1991 team. The 1975 team earned one win but in just five games played. The Owls are now 1-11 (1-4 A-10), and a lot has changed since a year ago. Following an impressive season and the subsequent A-10 Championship, turnovers and inexperience have been the reasons for the subpar 2009 season. The Owls have committed 70 more turnovers than their opponents this season. And those problems then hurt the offense. With the season’s end, the focus is on the future. The Owls will lose just three players from graduation this season. The game experience from this season should give Rosen hope that next year’s team can turn it around. Zenuk and fellow freshman midfielder Melissa Schweitzer have been significant contributors for the team in their first seasons. Zenuk has seven goals, while Schweitzer has 11, second most on the team. Each has played in every game this year, and Zenuk has started all 12 contests. “We’ve had a lot of challenges to overcome, and I think that it will only help us with every step we take for next year,” Zenuk said. With three games to go, the Owls are playing for pride and preparing for next season. It could be some time before the lacrosse team sees another season like last year, but the struggles of today will hopefully be rewarding in the years to come. The goal for the rest of the season is simple then. “To beat everyone else,” Schweitzer said.